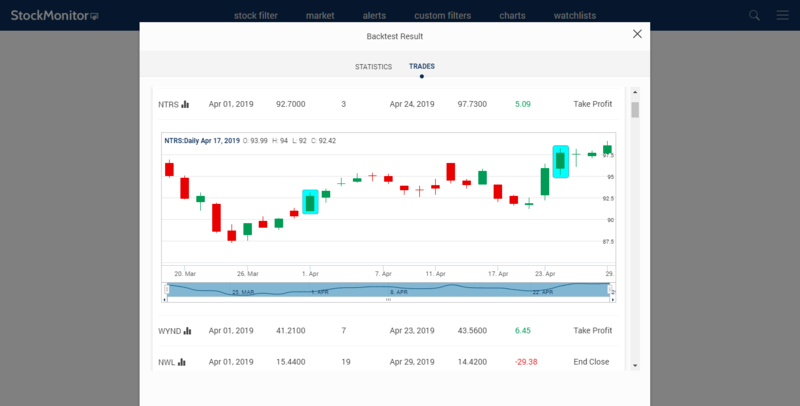 Stock Monitor - Stock Filter, Portfolio Tracker and Backtesting. Stock Monitor is the new, fast way to scan the market. Get access to real-time watch lists and portfolios for monitoring your strategies. Combine filters and back test. Use technical analysis charts and configure alerts to give you a profitable edge. Ready to try? 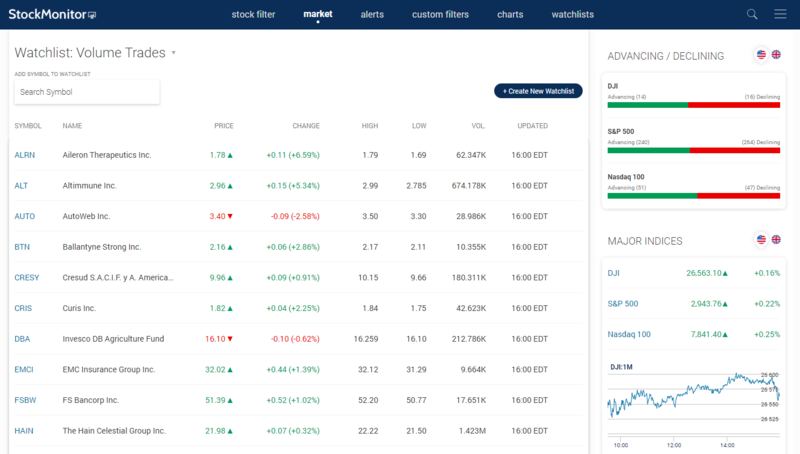 Start adding stocks to real-time watch lists for free with our 14 day trial. 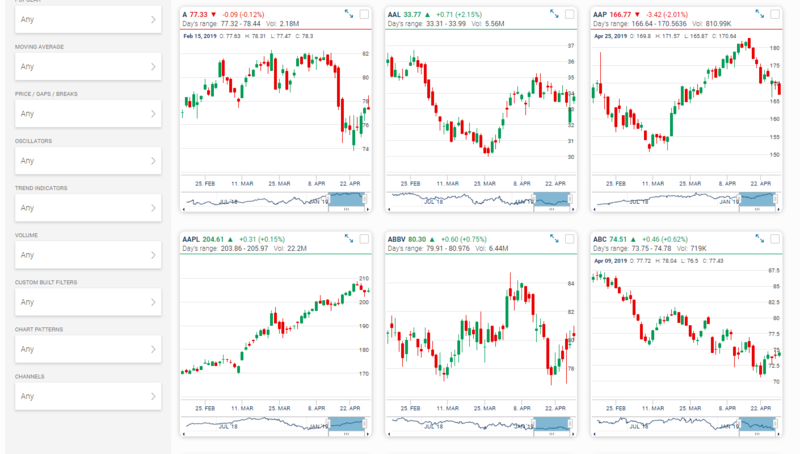 High & Low Breakouts, Indicator Crosses, Gaps and More As Soon As They're Detected. 3 Steps To Profitable Stock Analysis. No payment required to start. Enter your email, or use Facebook or Google to get instant access. Select pre-built filters, or build your own easy, using hundreds of indicators and price levels provided. Supercharge your profits with unlimited watchlists, alerts, backtests and charts. Make stock trading easy! Here's What You Can Do Inside Stock Monitor. Detect momentum stocks - Pre-built Relative strength filters detect stocks moving now. Open gaps - Filters to detect opening gaps, up or down, by percentage or custom values. Moving average crosses - Find any moving average crossover, in any time frame. 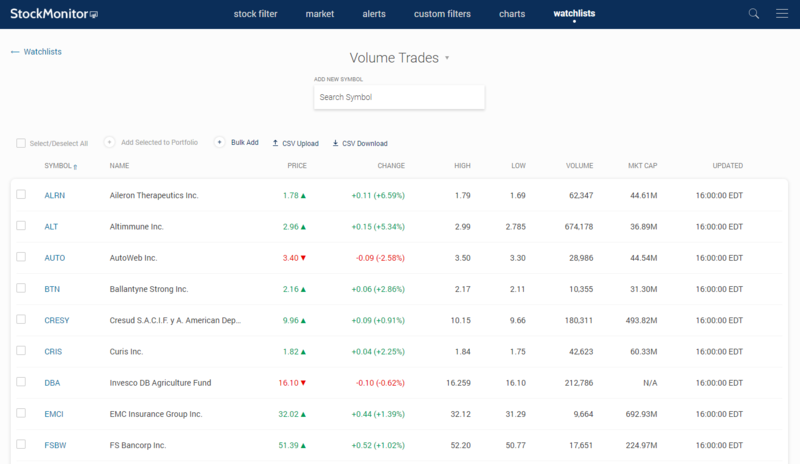 Unusual volume - Detect stocks which have unusual volume, above average levels. Breakout Stocks - Detect breakout stocks that have burst past recent highs or lows. Detect candlestick patterns - Every candlestick pattern can be detected fast. MACD crosses - Stocks with MACD crossing above zero, or signal line crossing. Instant Alerts - Don't want to miss a moving average cross? Set an alert. Build a filter - Choose from any indicator, candlestick or price pattern, hundreds provided. Quick chart views - Any filter can be easily viewed on a chart, just like an indicator. Backtest filters - Backtest any filter to see how it performs. Why Not Try It Out? - Check our free stock screener to find ideas now. 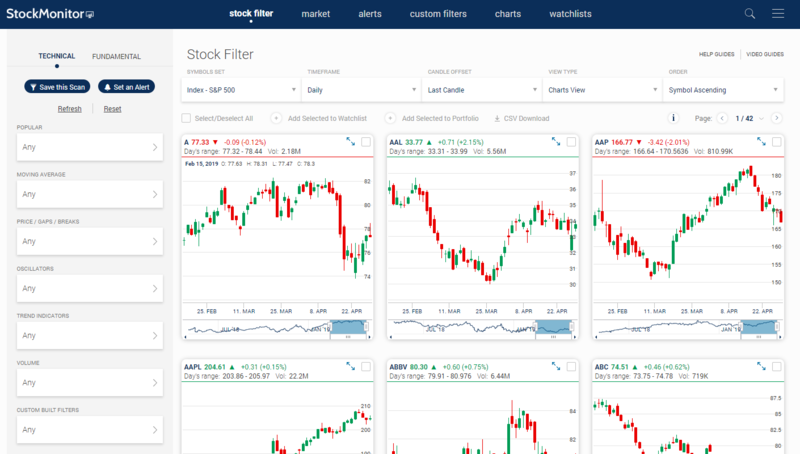 Blazing Fast, Powerful Filters, Testing and Stock Analysis Tools. 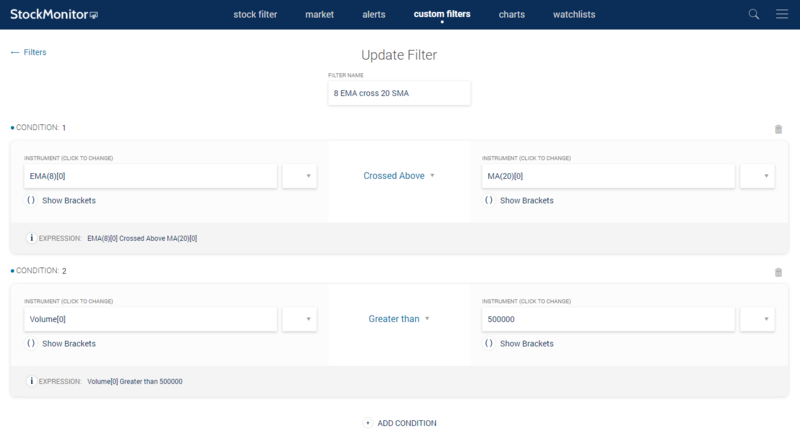 Use pre-built or custom filters to find stocks on the move, fast. Built a filter? Forward test. See it trade live on a virtual cash balance. Profitable? Blazing fast backtests on years of historical data. 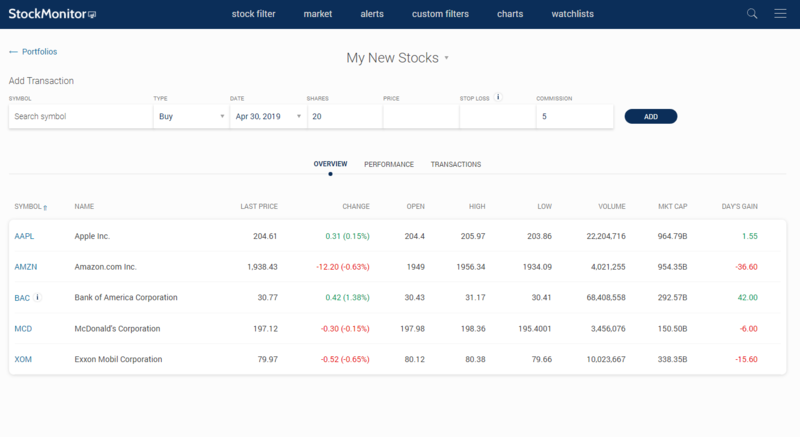 Instantly add stocks to watchlists and set alerts. 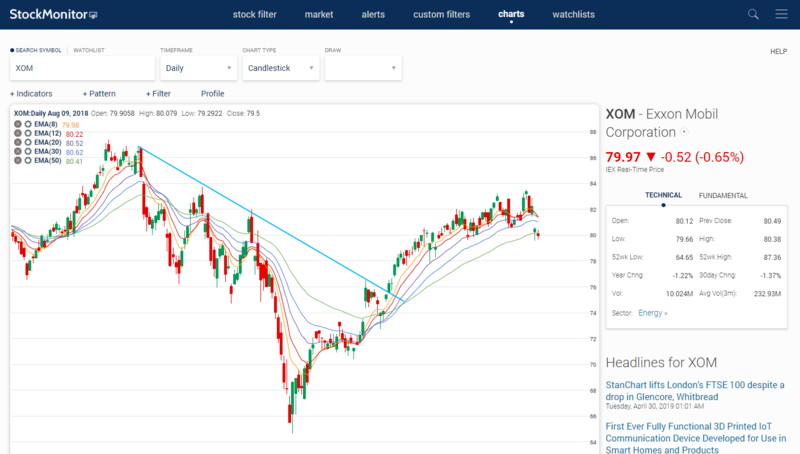 Beautiful stock charts with indicators, drawing tools and much more. Follow your stock portfolio and breaking related news. What Are Our Members Watching?